Save Your Finger. Do you have a feeling that your forefinger aches because you take too many clicks while using computer? 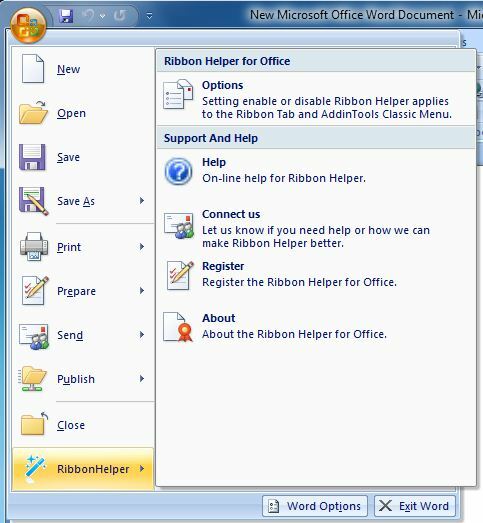 You’ll save endless clicks if you install the Ribbon Helper, which will automatically select the ribbon tabs and drop down the menus when you move mouse over them. Max Work Space. You can minimize the ribbon and get max work area, no click, just move mouse over ribbon to bring the tabs to front. Two Different Versions. We provide Classic Menu Helper and Ribbon Helper. 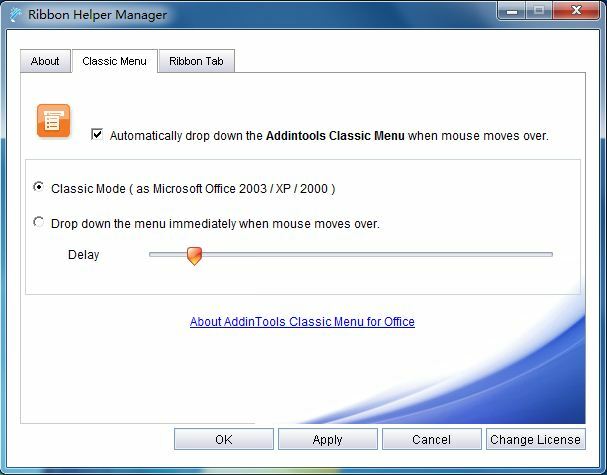 The Classic Menu Helper is fully free for all users (personal and commercial) of Classic Menu for Office. The Ribbon Helper is more powerful and the trial is free. Designed for the ribbon interface of Microsoft® Office 2007 and 2010. You’ll save endless clicks with your mouse when you are using Microsoft Office 2007 or 2010. With Ribbon Helper, to switch among ribbon tabs is never been so easy. There are over half a million users who have chosen our software: Classic Menu for Office 2007, 2010 and 2013 to bring back the Office 2003 style menus in Office 2007, 2010 and 2013. If you are one of our users, you can free use Classic Menu Helper to drop down the Classic Menu items without any clicks! It works in Word, Excel®, PowerPoint®, Outlook®, Publisher, Access®, InfoPath® and Visio® (except OneNote® and Project). Even if the ribbon is minimized, the ribbon tabs can still be automatically activated and expanded. Automatically drop down the classic menus when the mouse is hovering over. Microsoft Office 2007 or Microsoft Office 2010 (32-bit and 64-bit). Windows XP 32/64, Vista 32/64, Windows 7 32/64, Windows Server 2003 32/64 and Server 2008. Citrix System and Windows Terminal (Remote Desktop) Server. Enable/disable automatically activating ribbon tabs. Enable/disable automatically expanding classic menus. Adjust the speed of activating ribbon tabs. Adjust the speed of expanding classic menus. Change mode of expanding classic menus. 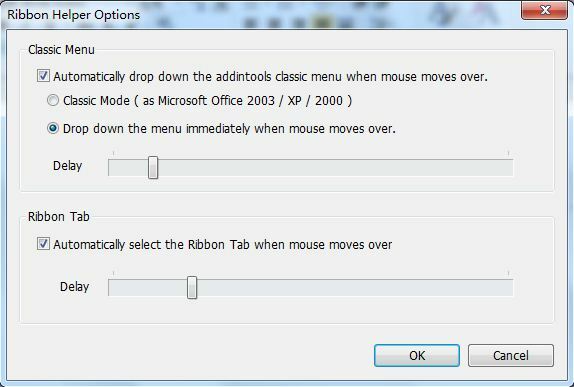 Mode 1: just like in Microsoft Office 2003, 2002 and 2000, a click at first and then drop down other menus automatically only by a slide. Mode 2: without any clicks, drop down the menu immediately when mouse moves over. You can also use the Ribbon Helper Manager to change setting. Single User License - $15.00 USD. For Enterprise/ Organization, more discount is available for volume licenses.